The Dragon Warrior series is known for expansive worlds and great storytelling, but the sheer number of titles may be overwhelming for newcomers. 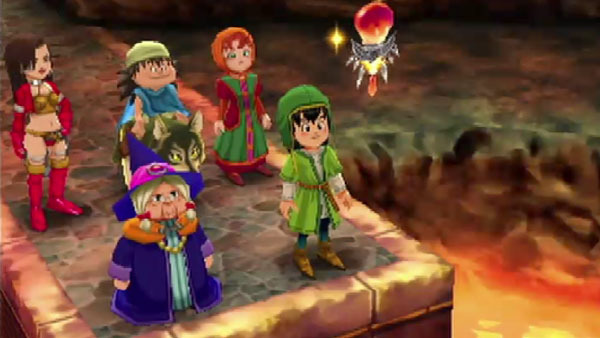 Thankfully, with an independent story, Dragon Warrior 7: Warriors of Eden makes it easy for anyone to jump into the Dragon Warrior series and doesn’t require you to be familiar with the franchise to enjoy it. There are many returning features like collecting mini medals and the ability to change classes, but the story, characters and the world are brand new. You begin the game by naming your character, who also happens to be the son of the best fisherman around. You’re nearly of age to join your father when destiny decides it has other plans for your young hero. Together with your best friends, the neighborhood girl Maribel and the prince of the next town over, Kiefer, you explore the peaceful land of Eden, a continent alone on a seemingly endless ocean. But a nearby ancient ruin reveals a portal to lands lost in time. As you talk to people and explore your surroundings, you’ll collect pieces of shards, that when combined, will open up a portal to a land in the past in need of saving. If you can successfully save the citizens from certain doom, their ancestors are suddenly alive and well in the present. Although some towns need more saving than others, as one town required intervention three times! These quests vary from saving a town from a volcanic eruption, to stopping a mechanical army from destroying another. Some of the towns are being tormented by a tough enemy that you will have to deal with in order to save them. Strong Points: Over 110 hours of game play, not including the bonus engines. Weak Points: No multiplayer or re-releases on newer platforms. Moral Warnings: Swearing, violence and sexual references. The boss battles are the same as normal ones with the exception of different background music. The random battles are pretty straight forward as you direct your party to attack, defend, or use magic. You may be able to flee from regular battles, but not from boss battles. If you die, half of your gold will be taken and only the main character will be revived at the last church you saved at. When a battle is won, experience, gold, and sometimes a treasure chest is left behind. When enough experience points are accumulated, a character levels up, though attributes and spells are automatically adjusted, leaving little room for customization in that regard. The only way you can impact your stats directly is by consuming seeds of magic, life, agility, resilience, and strength. Most weapons increase your attack attribute; however, there are a few that can be used in battle as a tool. Some weapons are cursed, and if you equip them, they may negatively impact your stats. Some of the magical attacks have really neat graphical effects and eye candy. The explosions, wind, water, and fire attacks are always fun to watch. Being the target of those attacks is another story. The towns and dungeons have a 3D over view and you can rotate to get a better viewing angle to spot those treasure chests that are not in the default field of vision. These graphics are on par with the Nintendo DS releases of Dragon Quest IV, V, and VI. Dragon Warrior 7: Warriors of Eden is the first Dragon Warrior game to be released on a Sony platform. While the Nintendo releases had a couple of ”d words” in them, this game had them more frequently and one of the bosses calls your party b**tards. Violence is a given, but it’s not gory or violent. One of the towns has a kid being bullied and your party helps intervene. You’ll make many friends, and some of them have romantic implications. There are sexual references, including the ability for your character to get “puff-puff” for good luck at the casino. As you progress in the story, you will need the help of the four guardian spirits (aqua, flame, terra, and wind) to defeat the powerful evil spirit. To gain the help of the wind spirit, you must agree to send her five cute guys a year. It goes without saying that a few of the characters you encounter are notably promiscuous. Those issues aside, I like how this game offers you choices and exposes the depravity and redemption of humanity in general. It even shows you the fallibility of the spirits that these people worship. There are moments in this game where you will be put on the spot and asked to make a choice on how to save a village. Sometimes the people asking you have impure motives and you have to look at the situation from multiple perspectives to uncover the truth. As you can imagine, the character development is great and the story being told is a memorable one. Since the boss battles get progressively harder, there will be times where grinding sessions will be required to be prepared for the upcoming battles. A necessary evil for many RPG games out there and this game is no exception. 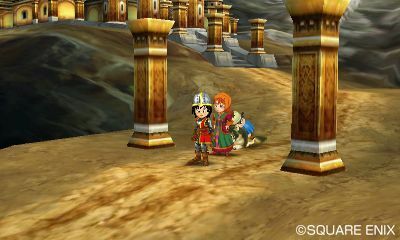 If you are a fan of the Dragon Quest/Warrior series this is a very long and great addition to the series. Just keep in mind that it’s not as family friendly as the Nintendo offerings.